The tour may imply a "Sibling Rivalry" but on stage it appears as if Luke Mitchell and Hannah Wicklund have a warm and winning relationship. The talented brother and sister will be traveling the States with their respective bands The High Divers and The Steppin Stones in 2018. 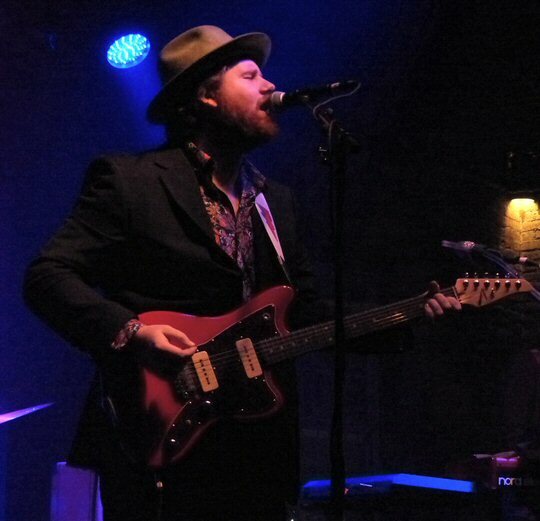 We attended an early date of the "Sibling Rivalry" tour at The High Watt in Nashville, Tennessee on January 18th. Both Hannah and Luke started out in South Carolina but have been recording or on the road steadily building their followings. At The High Watt each group had their own unique sound and style but clearly they all share a passion for music. Sibling Rival: Hannah Wicklund comes home to Nashville. Hannah states, "My brother and I have been on paralleled musical journeys our whole lives, but this tour will be the first time we combine forces and aim to bring Rock 'N Roll back to the forefront; a cause our family truly believes in," says Wicklund. "The positive side of our sibling rivalry is bound to come out on stage as we both push each other to be better than we were the night before. There's no relaxing on the job when big brother is around!" The High Divers call Charleston, South Carolina home but they are a band that would have felt equally as comfortable in the 60's Detroit Motown scene as they would hanging out in Topanga Canyon in the early 70's. Their new record Chicora will drop early March of 2018. The album is named after the community the band lives in and is a reflection of that place, personal experiences and their individual musical interests as a follow-up to Riverlust the group's 2015 debut which found its way onto many "best of" lists and was well-received up and down the East Coast. "We've been touring non-stop," says Mitchell. "We feel so static whenever we're home for more than a couple of days." 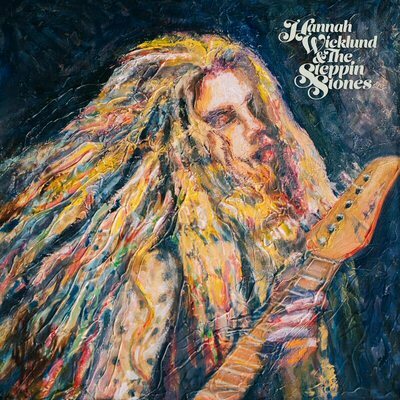 Their self-titled, third record Hannah Wicklund & The Steppin Stones is described as "an aural kaleidoscope of blazing guitars and searing vocals, all of which establish Wicklund as a triple-threat player, singer and writer in the fashion of Susan Tedeschi and the Pretenders' Chrissie Hynde. On the 10-track album, Wicklund taps into the fury of loneliness ("Ghost"). She resurrects specters of Hendrix and Joplin ("Looking Glass") as well as power ballad intensity ("Strawberry Moon"). Then, just as she's supercharged you with about as much raw energy as you can channel, she lets you down gently with the acoustic intimacy of "Shadow Boxes" - but even here, her singing achieves an intensity that most artists can only dream of rivaling. Her music stands on a bedrock of razor-edged, old-school rock 'n' roll reanimated by a new generation's urgency." The High Divers took the stage first. Luke armed with a guitar fronted the band handling lead vocals but others in the group added layers with their multi-part harmonies along with short yet satisfying solos throughout their set. Expanded instrumentation also enhanced The High Divers sound that ran the range from rocking to reflective. "Wild With You" was a winner with a good groove flowing into "Let Your Love Be Known." The nuanced "Never Let You Down" was moving as it segued into "Summertime" a bright and spirited piece featuring skilled solos from the band then concluding with a galvanizing "Give It Up." 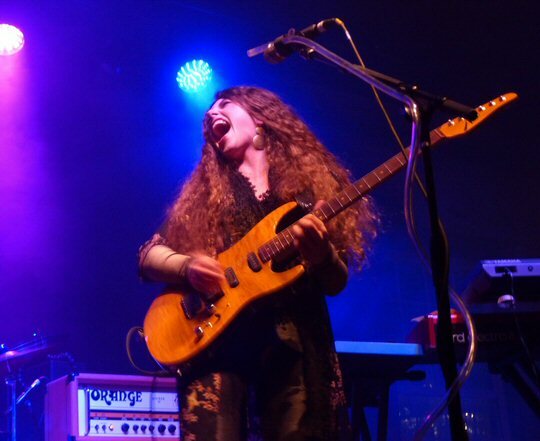 Guitar Player Editor-In-Chief Michael Molenda (posting at GuitarPlayer.com on 9/13/17) has heralded Wicklund "not simply as a shredder or a tonal colorist, though she certainly has chops and can go for some buzzy and less-than-organic sounds. What's impressive to me is how she uses her custom Tom Anderson guitar and Orange half-stack to drive the emotional context of her songs with a combination of spiky rhythms, slow lines, fast runs and cagey riffs. It all adds up to a thrilling ride." Hannah Wicklund & The Steppin Stones were thrilling in Nashville on the 18th. Hannah with a mane of curly hair had a distinctive stage presence but her musicianship was even more dramatic starting with the rich and robust "Jam in Em" followed by the bold "Bomb Through The Breeze" from the band's new album. Hannah was raw (in a good way) as well as riveting. Much of Wicklund's set featured songs from the latest record which should be a stand-out based on what we heard. "Shadow Boxes and Porcelain Faces" was one of the softer moments of the night allowing Hannah to showcase her expressive vocals in contrast to her mostly sizzling performance. Hannah who is only twenty can already shred with the best of them. She was also apt on the talkbox which she utilized on another current tune "Mama Said" to close her set. The High Divers and The Steppin Stones combined forces for a two-track encore of covers. The collective added their own textures and tones to "Don't Come Around Here No More" with Luke a suitable choice to handle the Tom Petty vocals. Neil Young's "Keep On Rockin' in the Free World" was rousing. The siblings duked it out on the axes leaving it up to the audience to decide who won the blazing battle but we would say we all were the winners of a great night of new music. The High Watt is part of the Cannery Row complex which is home to a number of concert halls and even a church. "Built in 1883, the Cannery was originally a flour mill and later a place to grind coffee. The building earned its name when the Dale Food company bought it in 1957 and began processing food (jams, jellies, mustard, mayonnaise, peanut butter, etc.) eventually opening a restaurant called "The Cannery" in the early 1970s. The building housed a country music theatre in the late 70s and evolved into one of Nashville's primary music venues in the 80s and early 90s. Jimmy Cliff, Janes Addiction, Iggy Pop, Lenny Kravitz, Midnight Oil, Greg Allman, Robin Trower among other touring acts of the time played the Cannery." Sibling Rival: Luke Mitchell of The High Divers.